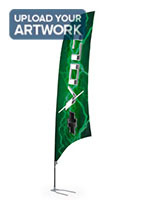 This swooper flag with full color printing has sturdy construction that stands up to frequent outdoor use. Feather signage holds up to conditions with the except for winds exceeding 20 mph. 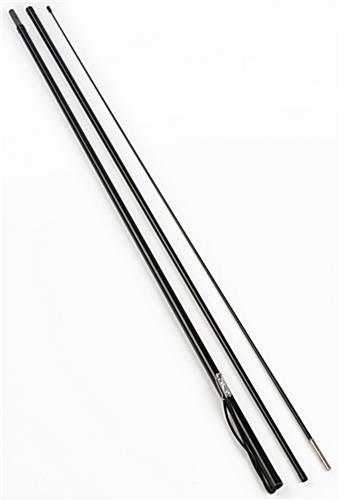 This flutter banner with custom single sided imprint is an affordable way to advertise at trade shows, concerts, and business and marketing events. The eye-catching curved shape and bold messaging that pops makes for effective, yet affordable messaging. 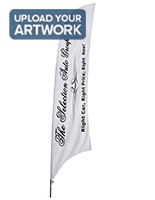 This flag with full color printing that is 188" tall can be seen from a distance in larger venues. This advertising feather display that is a beach flag has a car foot, so it sets up in a few seconds. 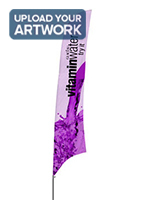 This flag with full color printing including CMYK are more effective than static signage when promoting. 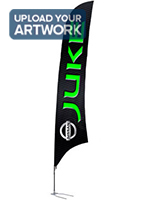 These feather banners are lightweight, portable and user-friendly displays with full bleed printing. The ink penetrates through the fabric and bleeds to the backside. This means that your custom image, text, or logo will be visible on the back, but will read in reverse. Text, logos, and images will read backwards [like looking in a mirror] when you view the flag from the backside, or when the wind turns the signage so the back is facing the observer. This is very typical in this industry -- 95% of all of these signs are printed in this manner. 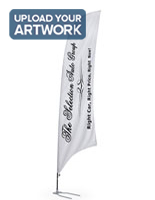 Buy this flag with full color printing, today! This feather banner is NOT designed to be used in winds exceeding 20 mph. Doing so may cause damage to the unit.